﻿B﻿eef kebabs are simple and fun to make, they could be added to summer barbeque parties. Beef kebabs are prepared with chunks of beef pieces and with plenty of assorted vegetables, all marinated in a vibrant mixture of ingredients that gives you a bursting flavor. Beef kebab is a colorful dish, it looks great and very tempting to eat. Serve these beef kebabs over onion brown rice for a full course meal or as an appetizer. You could also serve them as vegetable kebabs, add assorted vegetables like summer squash zucchini, capsicums, onion, mushrooms, tomatoes and small red or white potatoes. ​1. Rinse the beef well with cool water and pat it dry with paper towel so that there is no water in the cubes, otherwise marinade will get watery. 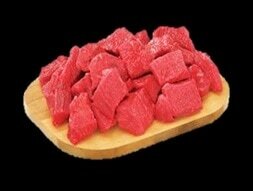 Trim away excess fat and cut the Beef into one inch pieces and place in a bowl. ​2 Remove the seeds from the capsicums and chop them into 1” pieces. Peel and cut the onion into 1” chunks and separate the layers. Clean the mushrooms, trim the stem, if using big tomatoes then take the seeds and pulp out and chop them into same size pieces as capsicums and onion. ​3 In a large bowl, add yogurt, lemon juice, minced garlic, tandrooi kebab masala, red chili powder, turmeric powder, garam masala,salt, cumin powder, black pepper powder and melted butter or ghee and mix them together and make a smooth paste. Red chili powder and turmeric powder gives nice color to marinade. 4. Dived this marinate into two bowls, one for beef and one for vegetables. vegetables onto the skewers leaving some space between each item. minutes because vegetables take longer to cook then meat. 9. After cooking for 2 to 3 minutes open the lid and turn the kebabs around, with brush apply some oil close the lid and let the beef and vegetables cook. Continue to turn the skewers every 2 to 3 minutes until all sides are lightly charred on the edges and the vegetables are crisp-tender it takes about 8 to 10 minutes to cook. Do not overcook otherwise kebabs become hard. 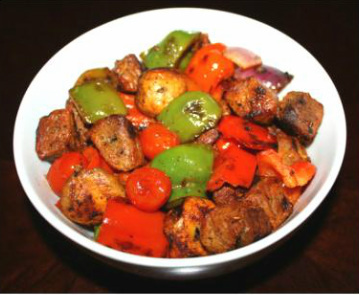 10 Once kebabs and vegetables are cooked take them off the skewers and place them on a serving plate. 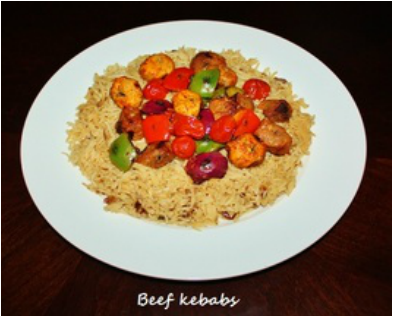 Immediately serve kebabs as a snack or serve them on the top of plain boiled rice or rice cooked with onions . 11. Serve kebabs immediately after cooking otherwise they become hard. 2. If you are not able to grill outdoors then kebabs can be cooked in lightly oiled ridged grill pan or in a regular pan over medium heat. 3. Kebab can be cooked in the tandoor. Thread the meat in the long tandoor skewer and cook in the hot tandoor for 7 to 8 minutes. 6. Hung yogurt is thick yogurt which is good for marinating. If you do not have thick yogurt, take plain yogurt, line a strainer with a cloth or a kitchen towel, put the strainer inside a mixing bowl. The bottom of the strainer must be suspended at least 1 inch above the bottom of the mixing bowl. Pour the yogurt in the strainer and place it in the refrigerator and leave it for 3 to 4 hours or until all the liquid has drips out of the cloth and into the bowl. Scoop out the yogurt and it is ready to be used. Strained yogurt should be thick and less than half the original volume.